As some readers may know, I have been trying to solve the mystery of exactly whom the Italian artist Costantino Proietto actually was. Recently, the artist's first cousin Nunzio LoCastro and his nephew, Larry LoCastro, both of New Jersey contacted me. Here are their combined stories of the artist C.Proietto, which I have edited for clarity. “Although I grew up in New Jersey and Costantino Proietto grew up in Italy, we were first cousins. While in the Army, I was stationed in Germany from 1951 - 1953. While there, I was fortunate to travel to Stuttgart, Germany where Tino, as we called him, lived and painted for many years. First, let me tell you a bit about his life. I know that his birthday will be a surprise, but his birth year was 1910, not 1900, as previously believed. I know, because I was twenty-six in 1951 and Tino was forty-one when we met. It is time to rewrite history, only this time it will be correct. In 1979, skin cancer was the cause of his death. In his early days, the oil paints had a very high lead content. When I met him in the 1950s, he had a sore on one finger that sometimes bled and would not heal properly. Costantino Proietto's father died when he was very young. In Randazzo, Sicily, Tino was soon was on the streets, smoking cigarettes and looking like he was up to no good. At age fourteen, a renowned professor of art came to the town, having received a commission to repaint and repair the artwork in one of the local Catholic churches. When asked who would be best to help the professor with his art, everyone in town pointed to Tino and said, "For his sake and ours, please take this kid off our streets". For the next eighteen years, Tino was apprenticed to the master artist and teacher. During that time, he received room and board, but no wages or compensation for his work. During his apprenticeship, Tino learned the new technique of applying paint with a palette knife. As he developed in his career, he never used brushes again. 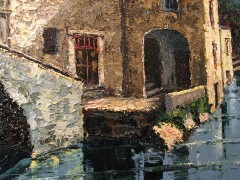 By using the palette knife, he was able to add layering and texture to his work. He then added detail, through the addition or removal of paint material. His technique added depth, warmth and perspective to his paintings. In the 1930s, with the approach of World War II, Tino emigrated from Italy to Switzerland, France and later to Stuttgart, Germany. At one time, he worked on a street corner, hand painting men's neckties on the spot. 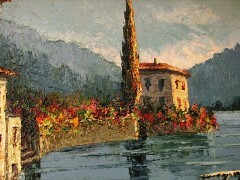 When he settled in Germany, he continued to paint scenes of Italy and Switzerland. In later years, he would photograph many scenes and then go to his studio to recreate the scene. In Germany, he was famous for his landscapes of Lake Como, Venice, San Remo and the Capuchin Convent on the Amalfi Coast. In addition, he was an accomplished portrait painter. Again working from photographs, Tino once created a stunning portrait of Adolf Hitler. His likeness of der Fuehrer was so lifelike that the Mayor of Stuttgart had it sent to Berlin. Although Tino received no money for the painting, he likewise had not trouble being an Italian immigrant, living in Germany throughout World War II. In 1952, when I married my wife, Doris in Vaihingen, near Stuttgart, Tino was my best man. So that you know, Tino was a devoted and loving husband. His common law wife Gisela was German, and they were together for the rest of his life. The had a great relationship. He spoke perfect German and she spoke perfect Italian. Communications were never a problem. When Tino died, he left two condos in San Remo and all of his worldly possessions to Gisela. After decades of training, painting came naturally to Tino. Although he was a great portrait painter, in his later years he preferred to paint landscapes. He was an energetic man and did not wish to spend the time required to paint portraits. 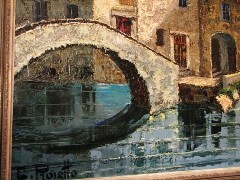 Throughout his career, Tino could complete one of his signature landscapes of Italy or Switzerland in only a day or two. At the beginning of each new year, Tino would paint daily, until almost Easter time. Then he would load the paintings into his car and distribute them to various Galleries around Germany. After his Easter break, he would paint until near Christmas time and then distribute his paintings again to the galleries. 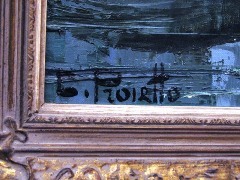 During his career, he produced and sold hundreds, if not thousands of signed C.Proietto original oil paintings. When I met him, he had a wonderful apartment in Stuttgart, with oriental rugs and fashionable furniture. Paintings by other artists graced his walls. On his work days, Tino would walk one or two blocks to his studio. The studio was one big room, with lot of windows. This allowed natural light to inspire his creative processes. When he was working, he would paint all morning, return home for lunch with Gisela, put on a fresh shirt and head back to the studio. When it grew dark, he would stop painting and go out for some personal time in the City. What you cannot see, but perhaps you can feel from his paintings was his enjoyment of life. He was a smoker, although it never affected his health. When he was out on the town, he loved to eat fine foods. He was a great cook and could make a fine meal at home. Although he would drink wine at appropriate social moments, Tino preferred "acqua minerale". Most of all, he had a great laugh, which I remember still. He was always laughing, telling stories over a meal and encouraging others to enjoy themselves. After eighteen years as an unpaid apprentice and having survived the Allied air raids on Stuttgart during the war, Costantino Proietto went on to enjoy every day of his life. He told me that if he "died today", he was happy with his life. He was always happy with life. “Finally, I had the opportunity to talk with my uncle, Joseph Amante. Joseph is also a cousin of Costantino Proietto and visited him in Stuttgart, Germany. Although I have not yet spoken with my Uncle Nunzio LoCastro (see story above), I am providing biographical and family history for you here. I have taken a number of pictures of Joseph's paintings, but have not yet transferred them all to my computer. However, I have attached pictures from my prized possession painting by Uncle Tino. It is a scene which includes the footbridge at Nesso, on Lake Como, in Switzerland. You might also find interesting some close up detail shots from the same painting. Note that in the rowboat a dark haired oarsman rows a blond female passenger in a custom built craft. On a bum-around trip to Europe during my late teens, I had the pleasure seeing Tino paint in his studio. I watched him take dabs of color and apply it to the canvas in what seemed like rapid succession. I did not realize what was happening (being painted) before my eyes until I "saw" the picture come to life. The process and the result were amazing to see. Here is some brief history regarding my family relationship to Costantino Proietto. Starting, I believe in Randazzo on the island of Sicily, Tino's mother was a daughter of Salvatore LoCastro. She had a sister Antonina who was my Uncle Joseph Amante's mother, and a brother Frank LoCastro. Frank was my grandfather. Frank, Salvatore, Nunzio, Vivien, Richard, Margurite, Costantino, and Joseph Amante were all first cousins by their grandfather Salvatore LoCastro. Costantino Proietto was from Sicily and sensed upcoming conscription for the Second World War. In order to continue with his art, he went first to Switzerland and later settled in Stuttgart, Germany. There his brother, Epiphaneo, sister-in-law Brunhilda, and nephew Mario, joined him. Brunhilda survives to this day. Tino found ready customers in the German people, who loved his paintings of Italy. Some of his early work in Switzerland included painting the walls of a church, and restoring Egyptian mummy cases under an art professor. In addition, he painted designs utilized later in the creation of printed fabrics. Author’s note: In the time since I first published this article some new information regarding Costantino Proietto came to me. As I learn more about the life of the artist, I will make corrections to this and to my earlier articles on the subject of Costantino Proietto. If any reader has additional information regarding the artist, his works or biography, please contact me via email. I will be happy to share such information with all. 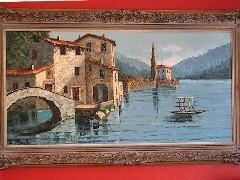 In addition, if you have a signed C.Proietto painting in its original frame, in good condition and for sale, I will pay $400, plus reasonable packing, shipping and insurance costs for each C.Proietto painting.